During one of my visits to the Philippines last year I was at a little coffee shop with my two aunties. We talked about life, had a drink of choice, and a little treat to accompany it. The whole idea of going somewhere solely for coffee and conversation is new to them. I guess growing up in the Philippines that just wasn't what people did. I'm a real sucker for the Starbucks culture, Macbooks, Google, Social Networking, and obviously blogging. I have no problem spending 4 dollars on a Grande Soy Chai Latte just to go somewhere and journal and maybe people watch. In the meanwhile, I still dream of working somewhere my gifts and skills will be used. And ideally in a place I'd like to be (where I can grow). One possible opportunity is with the Catalyst Conference. I'd specialize in helping next generation leaders stay encouraged throughout the year and assisting them with attending the Catalyst Conference. (learn more here: www.catalystspace.com) That would be a dream! The people that work for Catalyst seem so great and I'd be spending most of my time doing something I enjoy. The headquarters is in Duluth, GA. They wanted to continue with interviews, but had to put the hiring process on hold until after the Conference this fall. 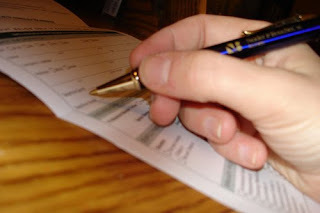 So, the rest of this summer I'll spend trying to use methods from people such as Dave Ramsey to start budgeting smarter and getting rid of debt. 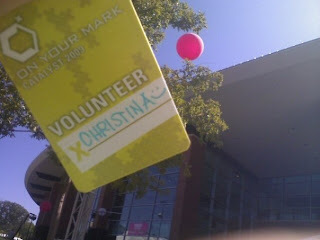 Then by October hopefully be able to volunteer at the Catalyst Conferece in Atlanta. All in between I'm learning how to be a beach bum with my new free beach parking permit! Woo Hoo. I recommend this book to help you get a picture of the reality of what God is doing through Servolution so that you will be charged with the electricity to join in on what's happening. 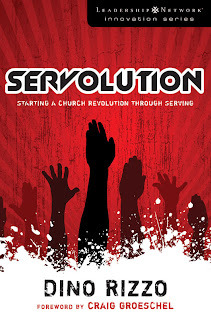 In chapter 4, I'm reminded that Servolution is all about Jesus. He was the ultimate servant even to the point of death on the cross all for our sake. 1. When we focus on caring for people, God takes care of the church. 2. Servolution is about expanding the kingdom, not just our church. 3. Every Christian needs to serve. 4. Servolution reminds us that it's all about Him and not about us. God knows all of our needs, and as a good Father He seeks to care for His children. But He also wants to include us in this process by following Jesus' example of serving. The amazing thing is that God created the act of serving to be something that in turn provides our own needs! He honors our sincerety in serving Him and others in all kinds of ways from healing to growth to deeper community bonds and closer fellowship with Him. "Therefore do not be anxious, saying, ‘What shall we eat?’ or ‘What shall we drink?’ or ‘What shall we wear?’ For the Gentiles seek after all these things, and your heavenly Father knows that you need them all. But seek first the kingdom of God and his righteousness, and all these things will be added to you. My interview with author Frank Viola on his new book "From Eternity to Here"
1. if you were in an elevator with someone and they asked you what is the ageless purpose of God, what would you tell them? 2. what are some challenges you find about believing and knowing God's purpose? 3. what is the simplest way to describe and recommend this book to someone else? whether they are in ministry or are a lay person passionate about God. i.e. "you should read this book because..."
My godsons are now half a year old! Can you believe it? Wow, it never ceases to amaze me how fast babies grow. Every morning before work I greet them good morning and then good-bye. It's so sweet and a simple thing I cherish. Waking up at 5 a.m. sometimes to their crying, not so much. But it's all good. haha. 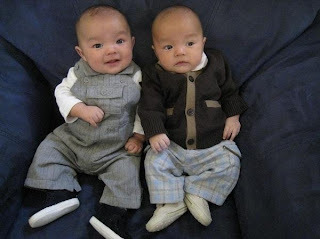 That's West on the left and Devin on the right. This picture was taken during Easter. Well, it's been a month since my last update. New stuff? -Have a 3rd interview with Cafe1040.org, God Willing. It's a really great ministry in Atlanta that mobilizes students and young adults into missions to the 10/40 window. I'm seriously praying about this one. I truly enjoyed the first 2 interviews I had with a staff member and the founder. Pretty cool when you can enjoy interviews, right?! :) I feel at peace about it, but it is a little hard for my brain because it's a fully-supported position. Meaning, I will need to raise enough support to live for a year in Atlanta. I've never done anything like that; but if God wants me there helping students seek God in calling them to do missions overseas then He will make it happen! -Friendships. I've made some great friendships so far here in Naples. My life is on a roll and there never is a dull moment. At first I didn't want to really get that involved with people down here because I wasn't sure God would keep me here. But I just couldn't avoid it any longer. Being open to whatever God wants me to do is a real challenge that way, because I want to finally settle in one place for a good amount of time. Although, the upside to it all is that I have awesome friends all over the country and the world. -Blog Circuits! So I'm on Twitter a lot (follow me! @therealshortyc) and have subscribed to lots and lots of people on my Google Reader. Through the interwebs I stay on top of some awesome things going on all over the country with missions and ministry. And I'm connecting with people all the time. Lately, I've been getting into blog circuiting. I received my first free book in the mail which I'm reading and will post about. And a second book is on the way which I will skim at first and come up with some interview questions for the author. He'll answer them and I'll post them to my blog. This is a great way to get connected with like-minded people and be more than just a reader, but someone who is involved in the momentum and movement of what authors are writing about. Ok, well I hope and pray you all are experiencing God's love no matter what season of life you are in. One thing I started is making a list of people to pray for. If you'd like to be added to that list, let me know! I almost died for Jesus! Okay, well maybe not really. But in a way, yes. 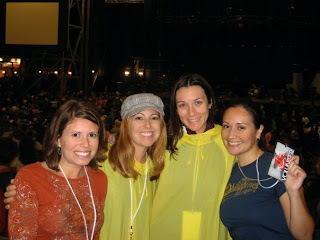 For Good Friday, April 10th, 2009 I drove up to Atlanta with 2 other girls (that's us on the left plus one from SC who met us there). That night it was dark, windy, and rainy. The event was being held at the Verizon Ampitheatre and two or three tornados had actually touched down all around us! Rain was gushing in horizontally, red clay mud was pouring in from the hills, the temperature was falling and rising, trees were swaying like crazy, you could feel the pressure in the air and see some clouds starting to swirl! But as the service actually started (at a delayed time) things calmed down and it was an amazing Good Friday service. Words just can't describe how special that night was as we reflected on and celebrated peacefuly, jubiantly, and joyously what Christ had done for us. And about 7000 people still showed! Then Easter Day in Atlanta was a gorgeous 72 degrees with sunshine and clear skies. The rest of that weekend and the road trip up and back between ATL and Naples was just a lot of fun as I got to bond with new friends and check out a new city. This month I have been in Naples 5 months already. Will I stay here? Will I go? That is still the question. 2 weeks ago I started my second course in Biblical Counseling called, "Theology in Christian Counseling." I hope you all are doing well. I'm staying busy, and things are good. Please feel free to send me any prayer requests you might have.